Infinite riser jet engine filter/barber pole phaser? I am trying to find a way to create an fx chain in AUM/audiobus that processes incoming audio to sound like it is being fed through a jet engine. I've tried swoopster however this app is incapable of producing the sort of infinitely rising/ barber pole phasing effect I am after. 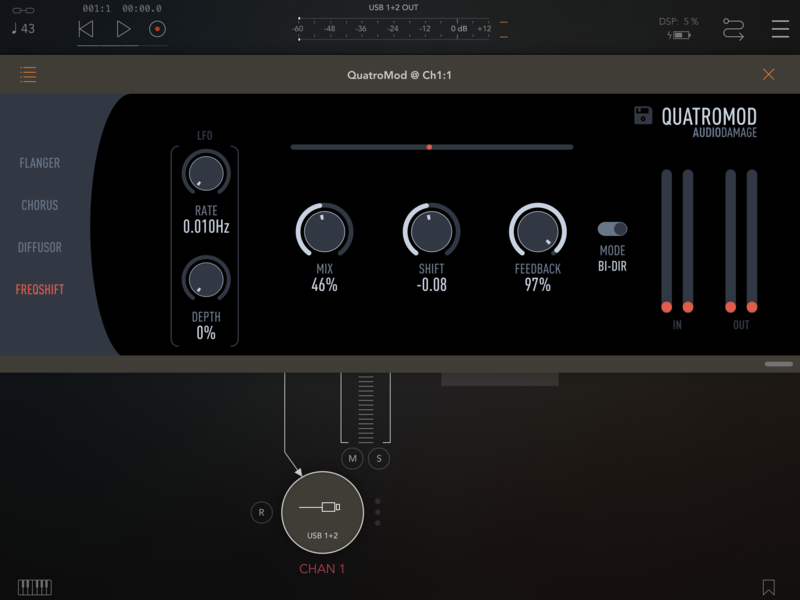 Izotope's mobius plugin does exactly what I am after however is only available as AU/VST on desktop and thus cannot be used on an iPhone. Is anyone aware of an existing app that can be configured to function similarly? If not can anyone recommend a way for me to achieve this on iOS? One that specifically uses shepherds tones for an infinite rise effect - nope. Try Filterstation2 by Audio Damage though. Each instance has two filters linked (and you can change the type) to which you can apply LFO to them. Maybe running them in parallel or in series might get you something. There is an infinite rise filter preset in Imaginado’s DLYM. Other than that you could look at Virsyn’s various effects. Frekvens should do it. Virsyn bandshift might, but I'm not sure if it has a built-in delay and lfo. I’ve actually just watched the video on Izotope’s site. Any delay app that has extremely low times and is automatable should do the trick. You could do worse than trying Elastic Fx and mess around with delays and automation button on. Also experiment with some distortion, subtle or otherwise, Pre or post frekvens ( frequency shifter by Erik Sigth ). Distortion will give you a bit more 'jet engine'. Thank you for this-how would you go about implementing this technique using Quatromod? here's an example of a slow, downward shepard effect. If you want it to go upward, shift toward positive values, and play with the MIX for a less subtle effect. I love this on percussion to add movement to an otherwise static pattern.